I remember the first time I heard the term “therapy dogs”, I really had no idea what they are. I remember that I did some research afterward and had a basic understanding of what they are. Since I recently heard a friend of me asked whether Havanese are therapy dogs or not, that has invoked my interest to write about it. In this blog post, I will both talk about what therapy dogs are and tell you whether Havanese are one of them or not. Let’s dive in. There are a lot of people that confuse therapy dogs with service dogs. I will clarify that in a moment. Let me try to first tell you what they are using layman’s terms. Therapy dogs are dogs that visit hospitals, nursing homes and schools with their owners to provide love and comfort to students, elderly, etc. In order words, they are nice dogs that are not aggressive and can make people happy. In other words, you can just view them as volunteers bring love to the world. Service dogs are dogs that are very well trained with skills that can assist the disabled and the elderly. A very typical example is a dog that can guide a person who is blind. On the other hand, therapy dogs do not have very specific training to assist people. 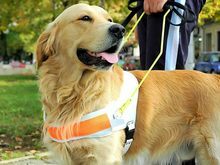 They are generally well trained enough to behave well and listen to the owner’s instruction but they don’t have special skills like guiding a blind person. There are a few characteristics that make a dog a good therapy dog. These include being friendly, patient, get along well with children and other pets. Do they sound like characteristics that your Havanese process? Up to this point, it seems like there is a good chance for Havanese to be good canditates for therapy dogs. Let’s find out right now. There is no doubt that Havanese, being so friendly and cheerful, are good therapy dogs. Of course it is the owner’s choice whether to let his or her Havanese to become a therapy dog. But generally speaking, most Havanese are great candidates. If you are a Havanese owner and you see a community center or an organization of that sort has some therapy dog programme, considering joining the program if time allows. People usually use the term “visiting dogs” and “therapy dogs” interchangeably. It is worth noting that some organization prefer not to use the word “therapy” unless the dog actually is involved with some therapy work. But most of the cases, they do mean the same thing. I am not sure about you, but I do sometimes want to volunteer. And then there comes a weird thought which is that it is kind of weird to go volunteer in an environment that I know nobody. Although I always want to have that one friend that is willing to go volunteer with me but that person doesn’t really exist for me and I bet it doesn’t exist for most people. I don’t know why. It just seems like that there is just a slim chance for two friends to want to volunteer together. I completely understand that the weird feeling of afraid of volunteering alone is totally irrational and doesn’t make a lot of sense. But we can’t really fight human nature as easily as we want to. Now, if you are like me and you have a Havanese, the whole problem is solved. Your Havanese would not deny or complain having to volunteer with you all the time. I bet your Havanese would love it. I always say that Havanese is the very best gift you can have. Think about it. While you may be verbally complaining to your other half that it is a little tiring to have to walk your Havanese 45 minutes a day, you deep down knows that it is your Havanese that gives you the opportunity to be more in shape. That’s the same for volunteering. It is your Havanese that allows you to do something so meaning in a fun way. It is fun because being around with your Havanese is always fun. Having fun and helping people at the same time is simply win-win opportunities that you don’t get easily elsewhere. Like other good candidates for therapy dogs, Havanese do need some basic training to become therapy dogs or visiting dogs. The point is to make them very friendly (non-aggressive) and willing to be touched and petted. They also have to be trained so they remain calm and friendly when they have to meet or work with other dogs. Havanese are already very friendly in most situations but they do tend to bark or get slightly aggressive when meeting other dogs. But generally speaking, they are already very close to being an ideal therapy dog, so it usually doesn’t take long for them to be well-trained. Knowing that Havanese are good therapy dog candidates, do you know which dog breeds are considered the best candidates? The answer is Labrador Retriever and Golden Retriever. These two dog breeds have a high tendency to be friendly and patient. They are also usually okay with getting petted or touched by strangers. In conclusion, therapy dogs are sometimes called visiting dogs. They are dogs that visit schools, nursing homes and hospitals to give love to children and elderly. Do not confuse them with service dogs. Service dogs are trained for specific technical skill. For example, some service dogs know how to guide blind people. Havanese are friendly enough to be considered good candidates for therapy dogs. Owners and their Havanese have to go together when they volunteer. That’s indeed a very nice opportunity for you and your Havanese to create have closer relationship.